Trident series 65, BAE Neve 10×2, Ampex MX-10 4×2. Otari MTR 90 MKII with 1 inch 8 and 2 inch 24 track headstacks, Studer A-810 1/4 inch 2 Track, Tascam DA-30 DAT, Tascam 122 Cassette, Tascam CD 500 CD Recorder/Player, Tascam 424 Cassette 4 Track. Pro Tools HD3 Accell + 96IO x 2, Lynx aurora 24 channels i/o, Apogee Big Ben Master Clock, Apple Mac Pro Dual Quadcore – 2.26GHz 10GB RAM, Lots of Plug-Ins. 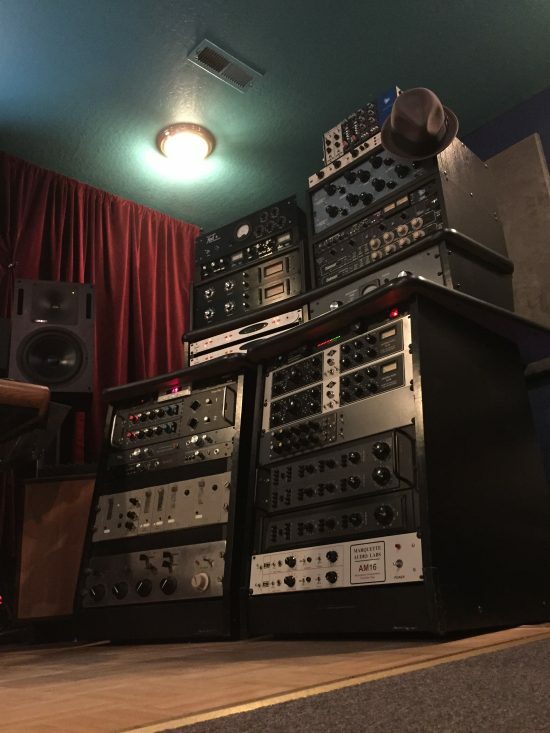 Neve 1272 (2), API 312 (6), Wunder audio PEQ (2), Telefunken V76, Telefunken V72 (2), Audix 35102 (Neve type) (2), Langevin AM-16 (2), Langevin AM4 (3), Universal Audio 610 (2), Ampex MX-10 4×2, 20 Channels Trident Pre/EQ. 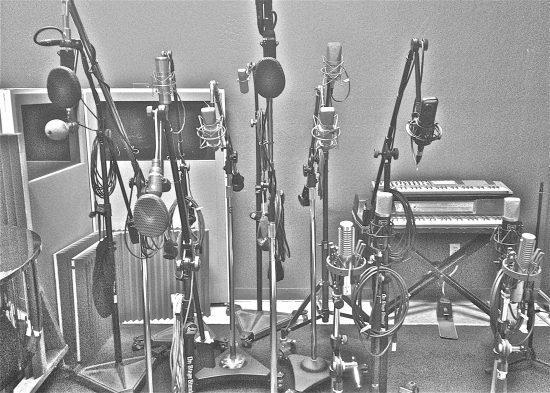 Flea U47, Sony C37A, Neumann M149, Vintage Neumann U87 (w/ innertube modification), Vintage Neumann U87, Neumann/Geffell UM57, Lomo 19A19 (2), Lawson L-47, AEA R44, AEA R88 (stereo ribbon), RCA D77, RCA BK11, RCA BK5, Coles 4038 (3), Royer 121 Ribbon (2), Peluso TR14 tube ribbon, Cascade Fathead II (2), AKG 414, Mojave MA-200 (2), Audio Technica 4060 (2), CAD E 350, CAD E 100, Rode NT2, Neumann KM184 (2), Shure SM81 (2), Shure BG 4.1, Sennheisser 421 (2), Electro Voice RE 20, Shure Beta 52, AKG D-12, AKG D-112, Pevey Kick Mic, Shure SM 57 (6), Shure Beta 57A x3, Shure Beta 58A x3, Shure Beta 58 (5), Audix D1, Audix D2, Audix D3, Audix D4, Shure PZM, Crown PZM, EV 560, EV Snare Mic, AKG D450, and other misc weird mics. 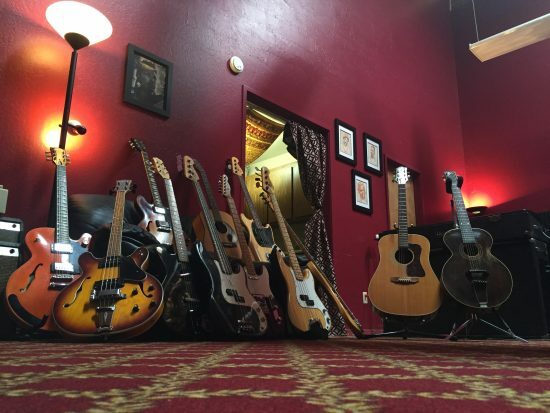 Gibson Tennessean Hollow body, Gibson ES330, Fender Tele, Dan Electro Convertable, The Gibson L-1 Archtop, Martin 0015, Segull S6, Guild D40, Fender 1974 P Bass, Fender MIM P Bass, 1976 Fender Mustang bass, G & L L-2000. Fender Twin, 1964 Fender princeton, Custom Designed Fender Vibrolux Replica, Mesa Boogie Maverick, Sears 20 Watt Tube Amp, Carvin 20 Watt Tube Amp, Fender Acoustasonic Jr, Ampeg B15, weird Rotating Speaker Cab. Yamaha Maple Custom, 60’s Ludwig Champagne Sparkle Kit x2, 60’s Gretsch round badge Champagne Sparkle kit, Ayotte 13 x 5.5 Wood Hoop Snare, 60’s Gretch 14 x 5.5 Round Badge Snare, Pork Pie BOB, Leedy 14 x 5 Tension Snare, Old Yeller No Name Vintage Snare, Ludwig Accent 13 x 5 Metal Snare. Roland 301 Space Echo, Fultone tape delay, Master Room Spring Reverb, Boss Spring Reverb, 30ft reflective hall way. Genelec 1032A, Yamaha NS-10, Adams A-7 Powerred Near Field, Avatone 6″ speakers. Furman individual headphone que x8, Q-Mix Head Phone Mixer, Sennheiser HD 535’s, Sennheiser HD 335’s, Sennheiser HD 280’s, Sennheiser HD 202’s, Sony 7506’s, AKG 240’s, Metrophones Drum Iso’s. Radial JDI x3, Pro-Co DB4 4 Channel Passive DI, RE-AMP, Multiple Misc DI’s. Baldwin Baby Grand Piano, Hammond C-3 Organ with Leslie 122, Hammond M-3 Tone Wheel Organ with Leslie, Sears Galaxy Organ with Drum Machine, Fender Rhodes 73 Suitcase, Wurlitzer 200A Electric Piano, Mini Moog Voyager, Korg Arp odyssy, Arp Omni II, Octive Cat, Nord Lead, Roland D-50, Korg Guitar Synth. Roland MC-307, Korg Rhythym 55, Akai MPC-1000. 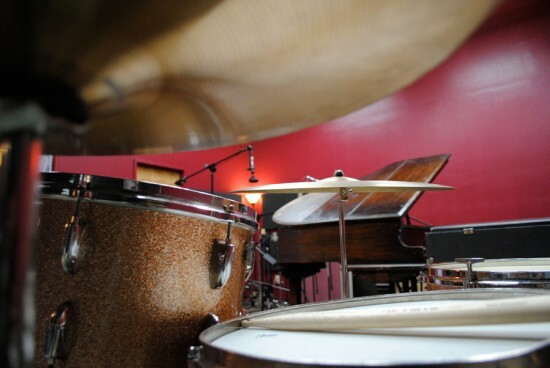 *In-house instruments are available for all sessions please contact us with questions.